Saturday, March 31 . . .
Last night Bill expressed an interest in seeing how my awning operates. This morning he comes over and looks the awning over, extending it the full length. It’s apparent the day is going to become hot very quickly. The campground is on the east side of Burro Creek. Therefore, if you have a view of the river and rock cliff, your refrigerator is on the western side and you sit in the afternoon sun. That is, if you don’t have an awning. I may not use the awning often, but when it’s needed, I’m glad I have it. Bill, Nita, Beck, and Diane ask for a tour of the Best Little Trailer. Kibble crumbs are on the floor because Spike refuses to eat out of a dish. He always knocks it over and then eats off the floor. I sweep that up. I hide a few dirty dishes in the sink under the sink cover. I wipe off the white surfaces and neaten the bed, placing the shammed pillows attractively at the end on either side of the table. Everyone piles into the BLT. “Oh, it’s so cute! “ “It’s so light in here!” “I like your quilts!” The compliments wash over me to my delight. I love to hear approval of my little home! I show them my storage drawers, and how the cabinet latches work. I point out that I didn’t get the microwave because a big kitchen cabinet is more important to me. Ditto on the furnace. I take the cover off the catalytic heater and boast how efficient it is. Bill turns on the overhead Fantastic Fan and I turn on the Endless Breeze fan, also made by Fan-Tastic Vent. Even though it’s getting hot outside, the BLT is very comfortable. Before leaving for their campsites, we talk about my solar panel, batteries, and wiring. Bill concludes, “You’ve got yourself set up real well here.” I’m so proud. Beck and Diane break camp and we hug goodbye. The afternoon is hot, hot, hot. The crew and I stay inside most of the afternoon to escape the heat. It must be in the mid-nineties. Maybe it’s time to move to higher elevation. But it’s only the start of April. I don’t want to experience a spring snow shower. The campground is nearly full with weekend campers. In spite of that, it’s quiet except for the occasional squeals and baby talk trickling down the slope from a young family camped above us. Once the sun dips behind the cliff, it’s cool again. I join Nita and Bill around their campfire for a glass of wine and conversation. They’ve been here over the fourteen-day limit. Tomorrow they leave for higher elevation near Prescott. I tell them I may follow them in a few days. Sunday, April 1 . . .
After a hike along the river with Bridget and Spike, I say goodbye to Nita and Bill. While the crew sleeps, I write a blog entry using Word and prepare photos for a slideshow using Picasa. This takes about two hours. Before I know it, it’s lunchtime. Since it’s cooler today, I relax outside with the crew, read, sip iced tea, and watch the heron gliding to and from her nest. Cliff swallows swoop over the river, and pairs of raptors (?) play what I assume are love games high, high above the cliffs. A tiny yellow verdin hops from branch to branch of a palo verde next to our picnic table, picking up small insects with its tiny beak. My hummingbird feeder is a hub of activity. Campers do a lot of hiking and a few even swim or wade in the river. In the early evening I see bats coming out of their cliff dwellings, and at night I hear the strange, raspy voices of raccoons. The campground sign says to leave shiny objects like eyeglasses inside so the pack rats don’t carry them off at night! I’m disappointed that I haven’t seen any burros. The road to where they can be found leads to an isolated area, and a creek has to be forded by vehicle on the way. There’s no cell phone coverage. It wouldn’t be wise for the crew and me to drive out there alone and possibly be stranded in the desert if something went wrong. By day’s end the campground is nearly empty. The crew and I drive the PTV up out of the canyon in search of an internet signal. Once found and the blog entry posted, the signal drops. Bridget and Spike are restless. As soon as I close up the laptop, we walk up the road. It’s early evening, right after sunset. Purple, orange, yellow, and white wildflowers line both sides of the road. The crew is happy. The blog is a lot of work. It’s good for me though. It gives me purpose and human contact, and always something to think about, photos to take. When the readers are kind, it’s fun. I wish I could have answered all those comments from people wishing us well. 3/26/12 . . . $30.07 for 7.34 gal. gas at $4.10 per gal. Wine with Nita and Bill sounds very inviting and cozy. I’m sure all of your readers, or posters, understand your in and out of reception areas. I can only imagine the time involved, as you have mentioned, keeping your blog going for all of us eager and ready to learn newbie travelers. Not to mention downloading all the photos. I look forward to taking videos and photos as well. Still, try not to worry about us readers too much Sue. You’ll get to it when you get to it. Enjoy without worry. That’s my motto! Well, one of them. 🙂 ( I have several!). How thoughtful of you, Corinne! My blogging has a self-centered aspect. I like to have a record of as many of my days as possible! And I do want to keep the story going, so to speak. We’re having a great time! The challenge of keeping up the blog adds another dimension. As much as i love to ready your blogs I do not expect it daily. You have a life, your there to rest and enjoy and not to consider bloging something you have to do, such as a job. Whenever you can, it is much appreciated. I feel like I have made a new friend and hope someday to meet you with a great big hug. Enjoy your next adventure! Hi to the crew! Sharon from Fl. I do hope our paths cross someday, Sharon! 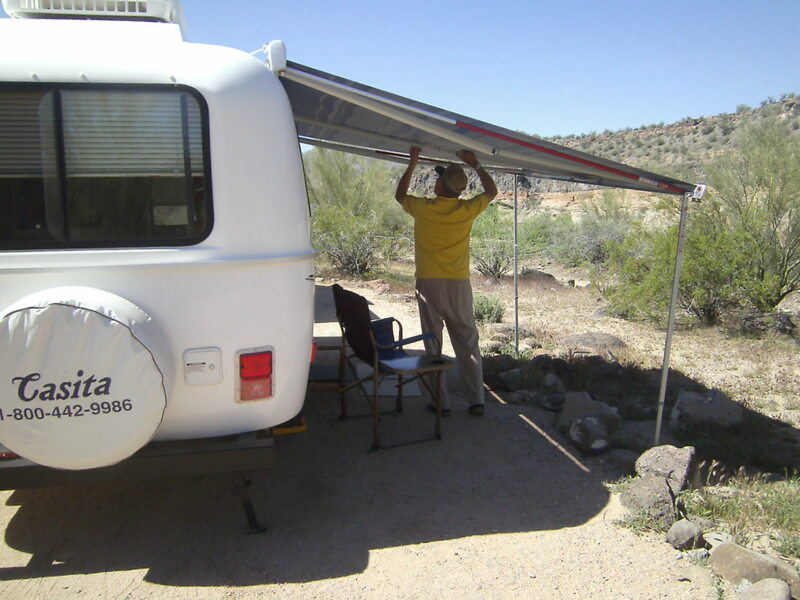 Ditto, I always read your blog after all it is nice to here what a fellow Rat Terrier owner goes through on the road as a full-time RVer where we plan to be in about 3 1/2 years. And your 2 remind me so much of mine – it truly must be in the breed… But I too completely understand and will patiently wait for your next chapter, after all you can’t always have internet… Mainly hope you enjoy each and every day. Rat terriers have the funniest habits. Spike talks to me sometimes .. . He makes a little grunting noise, I repeat it back, he makes the noise again, I repeat it back . . . on it goes like a conversation! I’m sure you can tell some crazy stories aboout yours . . .
Scottie, our Sheltie, talks all the time ! And when he wants something, is more vocal! Great photographs! This looks like a great little campground! You are gonna love the Prescott area! It is a sweet little campground. It’s handy for a one-night stopover on the way to somewhere else, yet it’s pretty and interesting enough to stay several days. You have every right to be proud of your Casita! You put so much thought and work into making it just right for you. I would pay to take a tour! LOL! I like to try to keep up my blog when we travel just so we have a good record of what we do and where we have been. As we are not full timers, when we get home to our brick house, I have forgotten about half of what we did and saw! I know what you mean about forgetting parts of a trip. I’ve gone back and read old posts and been pleasantly surprised at little things I had forgotten. Thanks for letting me know, Bob! It’s great that you posted your expenses. That is very helpful to others hoping to get out there soon (like us, hint, hint), but also helpful to those looking at gas prices if they are planning to come to the area you are in. My wife’s sister was just here over the weekend from Northern Indiana, where she paid almost $4.50 a gallon, but here in Arkansas it was only $3.77. Knowing the trends might help people avoid places where fuel is expensive. And like the others have said, son’t worry about blogging every single day. You have a life, too, and deserve to enjoy it. Most of us follow multiple blogs anyway, which also take time to read. By the way, our German Spitz, “Angel” likes his food on the floor, too. And he’s very polite, and hates to eat alone. If we’re not there to keep him company, he waits until we can be close to him! He kisses us good night and good morning, loves being held, and sometimes he just puts his paws on my leg and leans into me to give me a hug! Life is good! Now, what are you doing still reading all this stuff? Go have some more fun!!! It sounds like Angel is very pleasant to be around. I had a dog like that once. She knew my moods and if I were the least bit down, she would comfort me. Bridget does that a little bit, but it’s more worrying about me than trying to comfort. Spike, of course, is oblivious. If he could talk he’d probably tell me to get over it. Love your blog. Don’t know how you come up with something to write about nearly every day. We don’t boondock our selves but you make it look easy. I would find water management really tough. Always nice to hear someone loves my blog. How do I come up with something to write about every day? I write about nothing, that’s how! Ha! Water management isn’t hard. I fill up my water tank and 12 one-gallon jugs. I’m careful with my usage, but if I want to wash me, dishes, clothes, etc. . . .I go ahead. Hi Sue, since you posted expenses, here’s the update on your year and monthly expenses in case anyone’s interested. I’m guessing that over the summer you may have some higher expenses if you choose to camp with hookups so you can use the AC. It will be interesting to see how the year shapes up. I think you’re doing a fantastic job of living the lifestyle you want. As I think you said before, Living on (and with) Less and Enjoying it MORE. The pictures are great and I’m glad the blog gives you a “little” structure to your life. We all enjoy it but don’t let it ruin your enjoyment of living every day. Thanks, Reine! Keeping reply short, losing signal often. . . I give you credit, Sue, I’d be out of there with that kind of heat. I’d rather be sitting in a pile of snow! Especially in spring, it’s short lived. As others have said, I enjoy your blog and look forward to reading it. I kept diaries when my husband and I traveled, and I love reading back through them-it was before blogs were common and we had a difficult time finding any kind of internet on the road. We had to look for internet cafes and pay by the minute places to take care of business requirements which were slow enough to let us travel in the late spring and summer. I really wrote them and my blog for myself. The nice part of a blog, though, is that you can insert pictures. Spike cracks me up. He’s quirky like Jack. I have a friend who has a Cavalier King Charles Spaniel who should be like Little Lord Fauntleroy but he keeps up with the big dogs and rolls in mud any time he gets a chance. I call him the little dog gone wrong-he and Spike remind me of Jimmy Cagney. Bridget seems like the lady of the house. Give them both pats for me. I’m sure you know about Al and Kelly’s little Motormouse, but just in case I mention it in case you want to get in touch. Keep on enjoying your life and giving us a peek into it! Unfortunately, some low life wrote a terribly mean comment about Motormouse’ passing. I don’t understand some people. The good part is that so many people have provided support for Al and Kelly during these really tough days for them. I enjoyed reading your comment. It seems like you’re sitting here with me having a chat! I hate that Al and Kelly are suffering through the loss of their Motormouse. A picture comes to my mind, watching Al and Kelly on their morning walk down the lane at Darby Well, Pheebs bouncing around them and Motor in Kelly’s arms. I’m thinking that mean person moves from one blog to another under aliases, spreading hurt wherever he/she goes. I’ve checked the email address of a particularly mean-spirited person who commented on my blog and, of course, it was phony. Mean and cowardly! Thankfully the good-hearted people far outnumber the trolls . . . I really think that’s what makes your blog so inviting. You draw your readers in with your conversation. Odd, but the same visual popped in my mind as I sat and cried about the loss of Motor. So difficult. If you’re gonna leave the awning out, be sure to strap it down. The extra five minutes that takes will prevent any surprises from a gust of wind. You’re right. It also prevents an annoying flapping sound if there’s a breeze coming in from the side. I think of you whenever I use it! Great training for some of us ! Sweet comment, Marcia. I appreciate your good wishes. One of the blessings of never having much is developing an appreciation for that which is free. And it’s true . . . those are the best things! I wish you well, too. Just joining your adventures. We too have a Casita (Spirit Deluxe 2011) and we love it. Have not boondocked yet so we are going to learn through you 🙂 We are trying to figure out how we will stay in touch so very interested in your antenna, internet connections, and cell phone stuff. I have a Welsh Terrier “Bailey” who will travel with us. Had to put my other dog down last week and getting over that. So glad to find your blog. We are planning a trip to Zion NP in early September from Dallas, Texas so we have alot to figure out before we head out. You are such a creative writer. I almost feel like I get to be there with you. Keep up the good work when it is convenient. I am learning alot and enjoying your thoughts and adventures. I’m sorry I’m late answering your comment (due to dropping signal). I did reply the same day you commented, but it didn’t post. My condolences on the passing of your pet. It’s a tough decision to make, but sometimes it’s the best way. I know your Bailey will give you comfort as you grieve. I’m glad you love your Spirit! Aren’t Casitas great? They come with an antenna built into their shell which works pretty well — I’ve had up to 14 television channels. Of course, in some places, I get nothing, depending upon the terrain and location. For internet I use a Verizon aircard (nothing else), and my cellphone is from Wal-Mart with StraightTalk (no contract) also picked up at Wal-Mart. It works fine and it’s cheap. Have fun planning your trip to Zion! Just can’t beat a relaxing day at the river. Is nice to have internet, but sometimes good to not. You entertain us whenever you post. Hi, Gaelyn . . . I miss internet when I don’t have it. I use it for so many things, even identifying plants and birds. You’re right though. It’s good to get away from it, especially when there are better things to see and do. Hope all is well with you . . .
You go, Guy! I’m happy you’re continuing with my adventures . . . Always a joy to read your blog. Having cell service and internet is always troublesome when traveling, but just enjoy the travels and the beautiful scenery that surround you and enjoy your life. Carefull of the snakes around the rocks and water. No snakes yet, Sylvia! You have a great day, too. I’m glad you are still enjoying my blog. spike is a clown, he makes my day.when we get on the road,finally, we will hea straight to see y’all. Jack Russels are funny. They’re like Rat Terriers on Speed. I’d enjoy meeting you someday, Carol. Just contact me first. I get cranky when people drop in unannounced! Hi Sue- We’re parked at the Lake in the boondock mode. We stopped in Radium Springs on our return. My mechanic lives there and we replaced an actuator in a slide-out. Whew! what a job…remindied me of an ‘RVSue project’ !! Also had a strange electrical problem that all most stumped me. Very entertaining but bad timing! Both of my younger brothers are electrical engineers and graduated from NMSU (Las Cruces, NM) the same year, 1987. (They started 4 years apart-my younger brother took eveything twice!!) Later that year, my other brother bought a Scamp TT. FYI, I found a picture the other day of him posing proundly in front of it at EB Lake, the caption reading, ‘Dave-Easter 1988 with Scamp’! He bought it used and K did the upholstery for him that week-end. I know that Casita owners refer to their units as ‘eggs’, but looking my bros Scamp, it looks more like an EGG; the Casita is more like an ‘OMELET’! These Casita’s are driving us crazy…you know how you never notice a particular make of automobile until you buy one? K and I are scratching our heads saying ‘what gives’? Oh well, another episode of Dr Phil. Hi, Bill . . . Casitas are everywhere around here! I woke up yesterday and there were three of them parked next to me at Burro Creek Campground! Maybe it’s Casita migrating season and I don’t know it. Yes, that was Chuck and Geri’s Mothership you saw. The paint job on their rig is unique . . . I think it’s the nicest I’ve ever seen. I may not get that photo. It depends which way I go if I ever leave here. No offense but it’d be a 20-mile-round trip into Wikieup and you know I’m cheap! I went to the Wikieup P.O. a few days ago, but your letter hadn’t arrived yet. Hello to K and the kids! Have a great trip! Keep in touch . . . I’ll be seeing you soon. Actually Pie Town……… if I spell it correctly! A photographers dream with old buildings falling down everywhere!